Welcome to Palm Beach Past! Palm Beach County, founded in 1909, has a rich and wonderful hidden history. The blogs presented here vary from modern tales to stories of yesteryear. The first European inhabitants began settling in the area in the 1860s, and the pioneers began settling around the body of water known as Lake Worth. 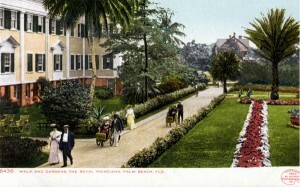 Henry Flagler arrived with his fortunes in 1892, and made Palm Beach into a world-famous enclave for the wealthy. By 1920, the area was booming with thousands of new residents. Today, over 1.3 million people call Palm Beach County home. The characters, the places, and the events all tell a story – how landmarks, towns, and cities were named, what buildings have been lost to the wrecking ball, and the celebrities who got their start among our palms. Read our interesting blogs on these subjects. We also have practical pages on DYI topics such as genealogical research, land research, and the wealth of information that can be found in newspaper archives online. Many of our more extensive research projects have been published in award-winning books. Click here to enter our Bookstore. We conduct local history tours such as the wildly popular Woodlawn Cemetery tours. Click here to learn about the next tour dates. Do you have a great story? Let us know – we would love to hear from you!